Anyone who cares about our communities – please consider standing for the community councils – they are open for new members and the closing date is the 23rd Sept at 4 pm. Applying is easy – details below. If we want the public to have more say about the key matters that affect our communities – such as planning, protecting our green spaces, schooling and a host of other issues – then we need good, public-minded people to stand forward. As we have already seen, the community councils have played an important role in enabling debate and representing the community view at Craighouse – this is the kind of important issue where CCs have a key – and statutory – role. The commitment need not be onerous. Most Community Councils meet every month to 6 weeks, which individuals attend if and when they can. Com Councillors should try to represent their communities. A good cross section of ages is always welcomed and young people can apply and would be very welcome (min age 16). The more people who stand, the more chance there is of having a positive effect on matters that affect our communities. 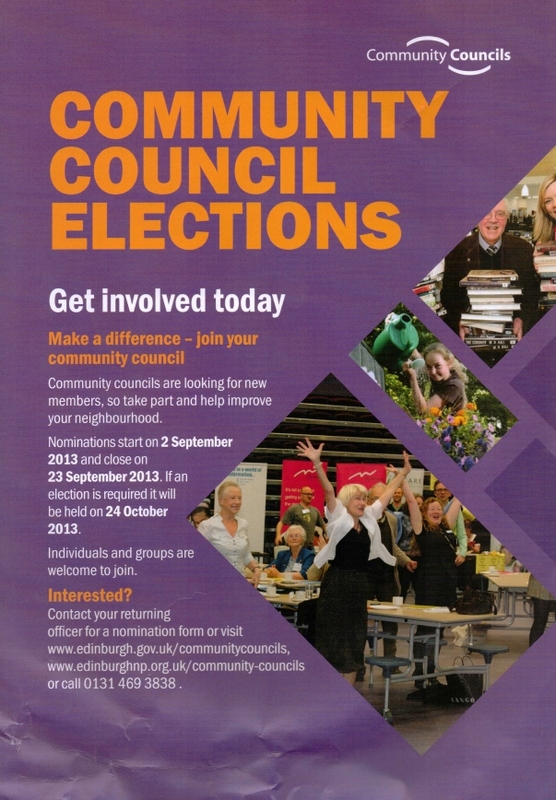 Print off the form from the following link: http://www.edinburgh.gov.uk/downloads/file/11179/elected_representative_nomination_form. All that is required is for two people in your community to nominate you by signing it (they can be neighbours or others) and the form should be sent to the returning officer by the 23rd September. This needs to be done by post or hand delivered rather than emailed. The closing date is 23rd Sept at 4pm. The returning officer for Morningside Community Council is Cllr Mark McInnes, City Chambers,High Street, EDINBURGH EH1 1YJ (tel:529 4958 email:mark.mcinnes@edinburgh.gov.uk). The returning officer for Merchiston Community Council is also Cllr Mark McInnes (details above). I hope some of you might consider joining and giving the community a bigger voice.